Knuth is the world renowned computer scientist and mathematician from Stanford who wrote The Art of Computer Programming back in 1968. The book is still not complete probably because one’s independent research process is ongoing. And on what short-term duration are we trying to answer the question? How about in the intermediate and long term? I’ll humbly submit that having a credible answer as to when a market risk is “priced in” should have a source that measured and mapped the evolution of the market risk to begin with. But that’s just me. Alternatively, on the Old Wall, these “risk on” moves from China to Emerging Markets to Italy are much more episodic. I guess that’s why Macro Tourists keep jumping from headline-to-headline instead of from time-series-to-time-series, across durations. So let’s round up the Top Takeaways from our predictive tracking algos and notebooks this morning, and do this, again! Oh, right. 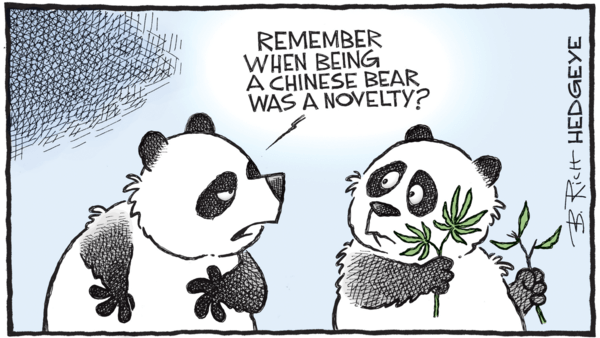 #ChinaSlowing + #EuropeSlowing is another big thing that led to yesterday’s US stock and bond market volatility thing that we need to know more about if “that was it” for more than a few days in this really big thing called #GlobalDivergences. “So”, what precisely, is going to stop #EuropeSlowing from slowing? The ECB? Ha! This brings us all the way back to what the central market planners of the world believe they can be. They fundamentally believe that they can bend and smooth economic gravity. 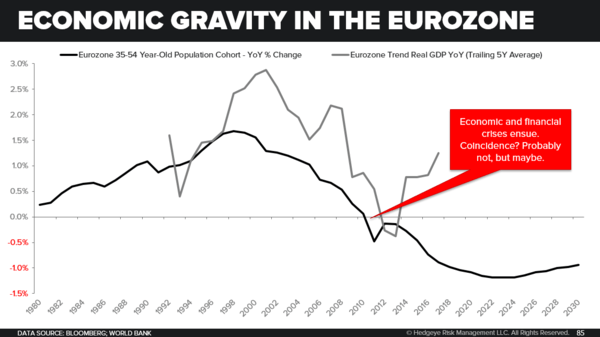 To simplify the most complex part of their pending calculus, I have one very basic question to ask the ECB and all those who worship at its bureaucratic alter: how do you stop the biggest spending cohort in the Eurozone from #slowing, demographically? That question might sound a little wonky for some. But I’m asking Nobel laureates, so they’ll understand why the Eurozone’s 35-54 year old population growth rate chart is one of the scariest charts in all of Global Macro research (Chart of The Day – slide 86).